Workshop Leader, “How to Plan Your Writing Career,” California Lawyers for the Arts, December 3, 2014, San Francisco, CA. Panelist, UC Berkeley Extension, October 24, 2014, Berkeley, CA. Speaker and Panelist, “7 Things you Need to Become a Change Agent” (opening speech) and marketing panel San Francisco Writing for Change, September 6, 2014, San Francisco, CA. Speaker, “How to Author Change” and “Prepping Yourself and Your Idea for Success,” Cape Cod Conference, August 7-10, 2014, Hyannis, MA. Speaker, “How to Blog a Book” and “Prepping Yourself and Your Idea for Success,” Writer’s Digest Conference, August 1-3, 2014, New York, NY. Speaker, “How to Successfully Manage Social Media,” Stanford Continuing Education, July 12, 2014, Palo Alto, CA. Panelist, “Getting the Word Out About Your Book, DigiLit, June 12, 2014, San Fransisco, CA. Speaker, “How to Blog a Book” and “Prepping Yourself and Your Idea for Success,” Penn Writers’ Conference, May 16-18, 2014, Lancaster, PA.
Speaker, “9 Steps to Prepare Yourself and Your Book for Success,” Dallas Fort Worth Writers’ Conference, May 3-4, 2014, Dallas, TX. Speaker, “How to Successfully Tackle Social Media,” Red Writers Conference, April 26, 2014, Santa Rosa, CA. Speaker, “How to Blog a Book” and “Prepping Yourself and Your Idea for Success,” Erma Bombeck Writer’s Conference, April 10-12, 2014, Dayton, OH. Panelist, “Blogging: How to Build Brand and Find New Readers,” Independent Book Publishers Association’s (IBPA’s) 2014 Publishing University, March 23, 2012, San Francisco, CA. Speaker, “How to Blog a Book,” Writers of Kern Spring Workshop, Bakersfield-California Writer’s Club, March 15, 2014, Bakersfield, CA. Keynote Speaker, “How to Succeed as an Author,” Genre-La Writers’ Conference, February 8-9, 2014, Los Angeles, CA. Workshop leader and Speaker, “Prepping Yourself and Your Book for Success,” “Blog Your Way to a Book Deal” and “How to Blog a Book and Become a Blogprenuer,” San Francisco Writer’s Conference (2 breakout sessions, a workshop and a talk during a post-conference bootcamp), February 13-17, 2014, San Francisco, CA. Speaker, “Blog Your Way to a Successful Self-Published Book,” Carla King’s Self-Publishing Bootcamp, Sacramento Branch of the California Writer’s Club, November 2, 2013, Sacramento, CA. Teleseminar Leader, How to Blog a Book, Writers Digest University, October 31—20, 2013. Speaker, “Blog Your Way to a Book Deal” and “Evaluate Your Book for Success,” Writing on the Sound, October 4-5, 2013, Los Angeles, CA. Speaker and Panelist, “10 Ways to Become an Author of Change from the Moment of Inspiration” (opening speech) and “Marketing Your Change-Inspiring Book,” San Francisco Writing For Change Conference, October 12, 2013, San Francisco, CA. Speaker, “Blog Your Way to a Book Deal” and “How to Write Your Sacred Text and Change the World,” Central Coast Writer’s Conference, September 20-21, 2013, San Louis Obispo, CA. Speaker, “Blog Your Way to a Book Deal” and Evaluate Your Book for Success,” Writer’s Digest Conference West, September 28-29, 2013 Los Angeles, CA. Panelist, “Advanced Author Branding,” uPublishU Book Expo America (BEA), June 1, 2013, New York City, NY. Speaker, “Blog Your Way to a Book Deal” and “Evaluate Your Book for Success,” Texas Mountain Trail Writers, April 18-19, 2013, Midland, Texas. Speaker, “Blog Your Way to a Book Deal,” University of California Davis, March 5, 2013, Davis, CA. Workshop Leader, “How to Evaluate Your Book for Success,” Bay Area Independent Publisher’s Association, March 9, 2013, San Raphael, CA. Panelist, “How to Blog a Book,” Mechanics Institute, March 12, 2013, San Francisco, CA. Webinar Leader, “How to Write a Short Book Fast,” Author Solutions, www.authorsolutions.com, March 14 and 29, 2013. Speaker, “How to Write a Short Book Fast,” Bay Area Independent Publisher’s Association, January 12, 2013, San Raphael, CA. Webinar Leader, “How to Blog a Book,” Author Solutions, www.authorsolutions.com, January 15 and 29, 2013. Teleseminar Leader, “Author Training 101,” 8-weeks, February-March 2013. Webminar Leader, “Author of Change,” 12-weeks, January-March 2013. Workshop Leader, How to Hit Your Targets this Year, Chadeish Yameinu, September 7, 2012, Santa Cruz, CA. Panelist, “Authors as Change Agents,” Writing For Change Conference, September 15, 2012, San Francisco, CA. Webinar Leader, “How to Blog a Book or Book a Blog,” Author Services, September 12, 2012. 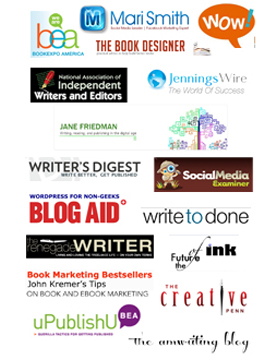 Speaker, “Blog Your Way to a Book Deal,” Spiritual Writer’s Conference, September 29-30, 2012, Mountain View, CA. Webinar Leader, “How to Blog a Book or Book a Blog,” Author Services, October 4, 2012. Speaker, “How to Blog Your Book,” Writer’s Digest Conference West, October 19-21, 2012, Los Angeles, CA. Speaker and Workshop Leader, “How to Blog Your Way to a Book Deal,” and “How to Successfully Tackle Social Media (Even When You’d Really Rather Be Writing),” San Miguel Writer’s Conference, February 13-18, 2013, San Miguel, CA. Speaker, “Creating a Winning Pitch,” Redwood Writers-CA Writers Club, August 12, 2012, Santa Rosa, CA. Panelist, “So What’s The Deal With Self-Publishing?” Northern California Book Publicity & Marketing Association, July 31, 2012, San Francisco, CA. Workshop Leader, “High Holy Day Preparation Workshop: Setting New Targets and Hitting Them in the New Year,” Chadeish Yameinu, September 6, 2012, Santa Cruz, CA. Speaker, “Promotion: Making Enough Noise to Create Change in the World,” Writing For Change Conference, September 15, 2012, San Francisco, CA. Speaker, “How to Write, Publish and Promote Your Work One Post at Time,” Writer’s Digest Conference West, October 19-21, 2012, Los Angeles, CA. Speaker and Workshop Leader, “How to Blog Your Way to a Book Deal,” and “How to Successfully Tackle Social Media,” San Miguel Writer’s Conference, February 13-18, 2013, San Miguel, CA. Workshop Leader, “How to Build an Expert Author Platform,” Expert Platform Building 101, Santa Clara, California, May 19-20, 2012. Speaker, “How to Evaluate Your Book for Success,” TMCC Writer’s Conference, Reno, Nevada, April 14, 2012. Speaker, “Blog Your Way to a Book Deal,” San Francisco Writers Conference, February 16-20, 2012. Speaker, “How to Blog a Book,” Writer’s Digest Conference, New York, NY, January 20-22, 2012. Workshop Leader, “How to Write a Book Fast! 4 Ways to Compile and Publish a Manuscript in Record Time,” California Writers Club-Central Coast Writers, Monterey, CA, November 12, 2011. Speaker, “Interpretation of Jonah Story,” High Holy Day services, Chadeish Yameinu, October 8, 2012, Santa Cruz, CA. Workshop Leader, “Writing a Perfect Pitch” and “Evaluate Your Book for Success,” California Writers Club-South Bay Writers Summer Retreat, Alamo, CA, August 2011. Workshop Leader, “The Priestess Practice” and “Everyone has a Torah,” 14th International Aleph Kallah, sponsored by Aleph: Alliance for Jewish Renewal, Redlands, CA, July 2011. Workshop Leader, “How to Write a Book Fast! 4 Ways to Compile and Publish a Manuscript in Record Time,” California Writers Club-South Bay Writers, Sunnyvale, CA, June 2011. Speaker, “Five Things Every Nonfiction Writer Needs to Get Published,” California Writer’s Club-Tri-Valley Branch, Pleasanton, CA, June 2011. Teleseminar Leader, “How to Blog a Book,” March 2011. Speaker, “A Post a Day is a Book a Year: How to Blog a Book,” San Francisco Writers Conference, February 2011. Speaker, “Five Things Every Nonfiction Writer Needs to Get Published,” California Writer’s Club-Berkeley Branch, Oakland, CA, January 2011. Featured Speaker, “Why Everyone Needs to Adopt the Motto ‘Never Forget’: A Look at Holocaust Memorial Day Across All Spiritual Traditions,” Center For Creative Living, San Jose, CA, April 2010. Workshop Leader, “Birthing Your Book,” San Jose, CA, March 2010. Workshop Leader, “Writing Winged Words,” Bay Area Metaphysical Meetup and Nonfiction Writers Meetup, San Jose, CA, March 2010. Speaker, “Five Things Every Nonfiction Writer Needs to Get Published,” California Writer’s Club-South Bay Writers, Sunnyvale, CA, March 2010. Featured Speaker, “How to Use Blogs to Promote and Write Your Book,” San Francisco Writers Conference, San Francisco, CA, February 2010. Featured Speaker, “The Kabbalah of Conscious Creation, 7 Steps to Mystically Manifest Your Ideal Mate,” Singles Chavurah, Chochmat HaLev, Berkley, CA, August 2009. Workshop Leader, “Learning to Live Life Fully: Rebbe Nachman’s Tools and Wisdom for Achieving Your Highest Potential,” 13th International Aleph Kallah, sponsored by Aleph: Alliance for Jewish Renewal, Columbus, OH, July 2009. Featured Speaker, “Navigating the Narrow Bridge, How to Move Forward Freely and Courageously Even When Life Seems Most Precarious,” Westport Hadassah, Westport, CT, March 2009. Workshop Leader, “The Kabbalah of Conscious Creation, 7 Steps to Mystically Manifest Your Physical and Spiritual Desires,” Westport, CT, March 2009. Featured Speaker, Gavilan Hills New Thought Church, Gilroy, CA, February 2008. Workshop Leader, “The Kabbalah of Conscious Creation, 7 Steps to Mystically Manifest Your Physical and Spiritual Desires,” Bay Area Metaphysical Meet Up, San Jose, CA, July 2008. Presenter, “Getting Your Story Published,” All Maggidic Conference, Berkeley, CA, July 2008. Workshop Leader, “The Kabbalah of Conscious Creation,” Makom Shalom, Chicago, IL, June 2008. Workshop Leader, “The Kabbalah of Conscious Creation,” San Jose Metaphysical Book Shop, Saratoga, CA, May 2008. Featured Speaker, “How to Create Sacred Space and Invite the Divine to Dwell Within It,” and “7 Simple Steps to Transforming Empty Rituals into Meaning-full and Spirit-full Practices,” Fox Valley Jewish Family Friends, St. Charles, IL, May 2008. Presenter and Workshop Leader, “The Kabbalah of Conscious Creation” (3-day class), “The Priestess Practice” (workshop), “Rx For Happiness” (workshop), “Navigating the Narrow Bridge” (workshop), Cactus Kallah, Tucson, AZ, January 2008. Featured Speaker, Gavilan Hills New Thought Church, Gilroy, CA, December 2007. Workshop Leader, “The Kabbalah of Conscious Creation,” Gavilan Hills New Thought Church, Gilroy, CA, October 2007. Featured Speaker, Gavilan Hills New Thought Church, Gilroy, CA, October 2007. Presenter, High Holy Day Retreat, Chadeish Yameinu, Santa Cruz, CA, September 2007. Workshop Leader/Co-Presenter, High Holy Day Preparation Weekend Workshop, Portland, OR, August 2007. Workshop Leader/Presenter, “The Priestess Practice,” 12th International Aleph Kallah, sponsored by Aleph: Alliance for Jewish Renewal, Albuquerque, NM, July 2007. Featured Speaker, Gavilan Hills New Thought Church, Gilroy, CA, June 2007. Presenter, “Writing for Publication,” Los Gatos Saratoga Recreation Department, Los Gatos, CA, April/May 2007. Presenter, “Planting Seeds of Change,” Los Gatos Saratoga Recreation Department, Los Gatos, CA, April/May 2007. Featured Speaker, Gavilan Hills New Thought Church, Gilroy, CA, April 2007. Featured Speaker, Gavilan Hills New Thought Church, Gilroy, CA, February 2007. Teleseminar Presenter, “Shabbat Candle Lighting: A Spiritual Practice for Women,” February 2007. TeleClass Series Co-Presenter, “Planting Seeds of Change, How to Give Root to Your Dreams and Watch Them Grow,” February 2007. Teleseminar Co-Presenter, “Planting Seeds of Change, How to Give Root to Your Dreams and Watch Them Grow,” February 2007. TeleClass Series Presenter, “Writing for Publication,” January/February 2007. Teleseminar Co- Presenter, “Planting Seeds of Change: An Alternative to New Years Resolutions,” December and January 2007. Teleseminar Presenter, “Four Ways to Create the Gift of Meaningful and Spiritual Chanukah and Christmas Celebrations,” December 2006. Featured Speaker, “The Kabbalah of Conscious Creation,” Whole Health Expo, Santa Cruz, CA; October 2006. Presenter, “Writing for Publication,” Los Gatos Saratoga Recreation Department, Los Gatos, CA, September/October 2006. Featured Speaker, Gavilan Hills New Thought Church, Gilroy, CA, September 2006. Workshop Co-Leader, Chadeish Yameinu, Santa Cruz, CA, September 2005. Workshop Leader/Presenter, “Candle Lighting as a Spiritual Practice,” 11th International Aleph Kallah, sponsored by Aleph: Alliance for Jewish Renewal, in Pittsburgh, PA, July 2005. Service Leader Spiritual Shabbat Service and Pre-Shabbat Spiritual Service, Congregation Shir Hadash, Los Gatos, CA, September 2004 – June 2005. Meditation Leader, Chadeish Yameinu, Santa Cruz, CA, September 2004. Guest Speaker/Leader, Kabbalah study group, Congregation Shir Hadash, Los Gatos, CA, September 2003- June 2004. Workshop Leader, “Navigating the Narrow Bridge, How to Move Through Fear and Live Life Fully,” Santa Cruz, CA, November 2003. Workshop Leader, “Envisioning 2003,” Santa Cruz, CA, October 2003. Presenter, 10th International Aleph Kallah, sponsored by Aleph: Alliance for Jewish Renewal, Bellingham, WA; July 2003. Meditation Teacher, Congregation Etz Chaim, Lombard, IL, September 2001- June 2002. Leader, Kabbalah Study Group, Congregation Etz Chaim, Lombard, IL, 2000-2002. Leader, Spiritual Support Group, Batavia, IL, 2001- 2002. Presenter & Meditation Leader, Congregation Etz Chaim Congregational Retreat, Lombard IL, May 2000, 2001 and 2002. Service Leader, Alternative, Spiritual Sabbath Service, Congregation Etz Chaim, Lombard, IL, December 2001, February, April, June 2002. Featured Speaker, Congregation Etz Chaim, Lombard, IL, July 1999, July 2000. Workshop Leader, “From Empty Practice to Meaning-Full and Spirit-Full Rituals and Prayers,” Congregation Beth Shalom, Naperville, IL, May 2002. Co-Leader, Women’s Support Group, Phoenix and the Dragon Bookstore, Atlanta, GA. September 1994-June1995. Co-Leader, “Anger, Arguing and the Art of Communication” series, Unity Church, Marietta, GA, January1994. Featured Speaker, Phoenix and the Dragon Bookstore, Atlanta, GA, September 1993. Co-Leader, “In Relationship to Relationships…,” Phoenix and the Dragon Bookstore, Atlanta, GA, April 1993.
offered meditations at High Holy Day services for Chadeish Yameinu in Santa Cruz, CA, in 2004-2007.
taught at the Congregation Shir Hadash Hebrew High School for three years in Los Gatos, CA. served as substitute leader for the Congregation Shir Hadash Kabbalah study group in Los Gatos, CA. created and led a spiritual Shabbat and pre-Shabbat service offered to the San Jose and South Bay Jewish community by Congregation Shir Hadash in Los Gatos, CA. served on the Congregation Etz Chaim adult education committee in Lombard, IL. founded and headed the monthly Kabbalah Study Group for Congregation Etz Chaim in Lombard, IL. taught Jewish meditation at Congregation Etz Chaim in Lombard, IL, and initiated and presented meditation sessions at its congregational retreats for three years. taught in the Congregation Etz Chaim religious school in Lombard, IL, and helped develop children’s and teen programming for the congregational retreat. developed and led an alternative, Renewal-style, spiritual/meditative Shabbat service for in Congregation Etz Chaim in Lombard, IL. worked with clients using her certification as a rebirther and a trained Voice Dialogue facilitator in Atlanta, GA.
co-led a women’s support group in Atlanta, GA, and facilitated a spiritual support group in Batavia, IL.